Little inverters to run stuff directly from 24VDC? I got a 24VDC bus at home, ran directly from a battery bank, and it is used to power simple things like lights directly and not so simple things like laptops, routers and chargers via simple DC-DC converters. For larger stuff there is a true sine wave inverter and a separate 220V wiring. I was contemplating if it would be possible to get rid of low power parts of 220V wiring entirely, by powering the remaining few low-power-but-AC stuff from DC bus using small inverters. We are talking about monitors, TV, a small NAS/PC and so on - 10W to 100W range. I looked around, and there does not seem to be any small size and/or sub-100W inverters around (any one know of any? ), so i thought of making my own. The first question is how much complexity can i trim off of it? As far as i seen and understood AC-DC converters, step one is always to rectify the AC to HV DC, followed by a switching DC-DC converter. So, would it be valid to trim off the whole bulky HVDC->AC stage and give out 170VDC straight into the (110-220VAC capable) input of, say, a monitor or computer PSU? If not, what sort of traps are there? The second question is, how is this normally done? I doubt i'm the first one to come up with such an idea, so are there existing solutions to run small AC stuff from a DC bus other than bulky generic inverters? 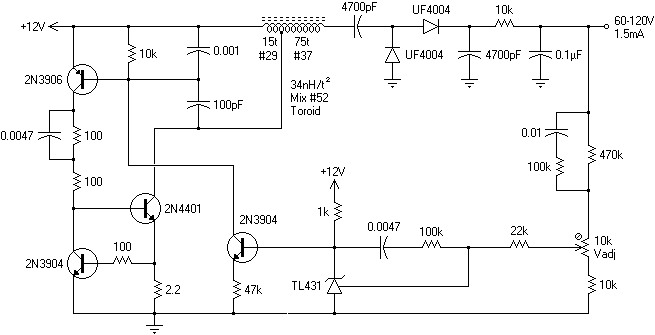 Re: Little inverters to run stuff directly from 24VDC? I would suggest a "flyboost" topology for the low end of the power range (below 50W or so) and a push pull with regenerative snubber above that. Have you considered using multiple low voltage DC/DC converters? You can use 4 DC/DC converters to replace an ATX PSU. Where can i find details and math for it? All the google returns are your posts on this forum. I did so where practical and there are things like PicoPSU that do the job for you, but i don't want to reverse engineer and/or modify PSUs in things like monitors. Note isolation, just in case the device does something funny with its DC input, like rectifies it, or accidentally faults it to an output pin, or exposed metal. The mains adapter is isolated (god, I hope so..), so you should do no less, just in case. 2. If the loads are all, themselves, SMPS converters, they're probably fine with a 170VDC supply. Beware PFC controllers, which may be confused by DC. (If it doesn't seem to be behaving, try to use a different adapter.) If they aren't rated for DC, open them up and inspect for anything that might not cooperate (mains transformers?). If you do this, it might not hurt to also check if the loads have fuses rated for at least the operating DC voltage. Even if the 170VDC source is (nominally) current limited. Point being, during a fault, the main filter cap discharges potentially all 170V in one huge surge, and the fuse acts as a shrapnel preventer, more than a fire preventer. 3. Anyway, automotive ~100W inverters should be damned plentiful. 24V input may be harder to find, but I'd still think they exist? Maybe more specialty/professional, more expensive? Ed: biggest downside I can think of, for replacing proprietary adapters (usually laptop cords): ID chip. If you have a spare adapter, it may pay to hack out the mains-converter bits and replace that with a DC-DC converter, so it still enumerates as an unmolested adapter. Ditto for USB chargers and whatnot, that may have ID or negotiation logic inside. Otherwise, the mains DC/AC approach will be best. I bought several inverters with blown H bridges. I just pulled out the bridge parts and ran my DVD player and the likes on that 160V DC. It is kinda pot luck. Many small wall warts work on as low as 55V DC at reduced output current. One limiting factor is the converter chips in these small supplies have a FET with about 40 ohms on resistance. As you can imagine that can produce a lot of heat with low volts and higher current. Once you get over 50W, many supplies do voltage doubling. I just bought a 180W supply that was 120V in the hopes I could get maybe 50W out of it at 80V. Inside there was a switch for 120/240 and it did voltage doubling at 120V. I powered it in 240V mode on 120V and it would barely function. 0. Can you run said loads on DC directly? Example: NAS is probably, uh Idunno, 5V 2A or whatever. A NAS is a computer-like box with several HDDs, rated at about 150W via something that isn't quite an ATX PSU, so not exactly. Otherwise, yes. Pretty much anything with a plugpack got powered with a DC-DC converter. 24V input may be harder to find, but I'd still think they exist? Seen some on e-bay, but the part i don't like is their size. biggest downside I can think of, for replacing proprietary adapters (usually laptop cords): ID chip. I don't think i ever encountered something like that. Not in laptops, at least - some phones do refuse to fast charge on a generic charger. Oh, I was thinking a tiny single-drive one But, yeah. 2/2 laptop adapters I have (a hugely representative sample, I know ) have something like this inside them. They're basically the same power supply, but one works and the other doesn't, for a given laptop brand. If you don't have any devices bound to brand-name adapters, lucky you. And yeah, phone chargers should be pretty generic, aside from the usual Apple douchebaggery I suppose.